This is just Phaze I of our new search facility. We will be developing this further, offering more ways of searching and more information, as time goes on. 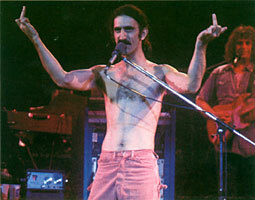 Meanwhile, use this page for to dig for truffles among the Zappa collection - but be careful! You may get more than you bargained for: it's all too easy to end up with something like a listing of every track on all six volumes of You Can't Do That On Stage Anymore! Where: the second menu lets you choose where you're searching, whether for tracks, albums, both or... new: composers. Match whole words only: if this is on, a search for 'try' will find You Didn't Try to Call Me but not Tryin' to Grow a Chin . If you want to find both - or if you want to look for something weird like 'ot al' as a phrase - turn this option off. Some of the information here (dates and such) comes from those amazing listings at the back of Greg Russo's listabulous book Cosmik Debris, so thanks, Greg! We may well extract some more fragrant morsels as the site develops.